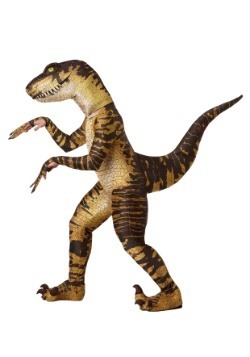 Dinosaurs roamed the Earth millions of years ago. They were the kings of land. No one told them to go to bed, or be nice to their sister or to have that report done by Friday afternoon. 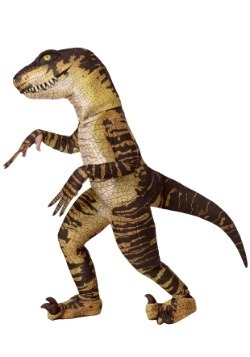 Just imagine your boss telling a Tyrannosaurus Rex that he's not going to pay him overtime! 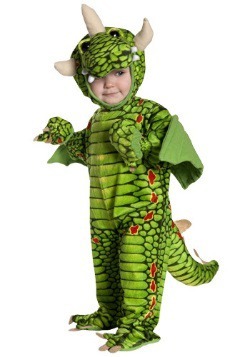 That's probably why everyone, from the tiniest toddler to the most serious of adults, keeps a soft spot in their heart for those giant lizards who once dominated the food chain. 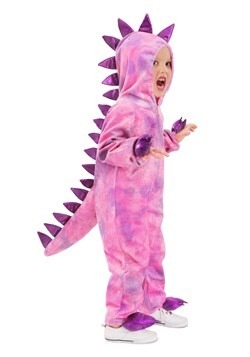 That's also probably the reason why dinosaur costumes are one of the coolest things you can wear for Halloween, play time, or goofing around. 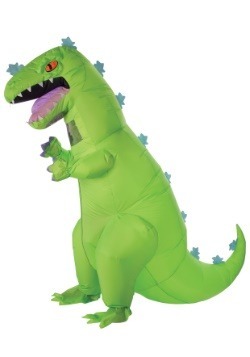 That's right, a dinosaur costume is still at the top of the Halloween chain. And don't forget Fido! 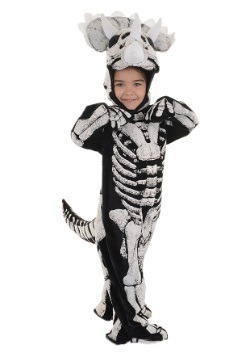 Even your dog secretly wishes that he was born a vicious prehistoric beast and we have dog dinosaur costumes, too. 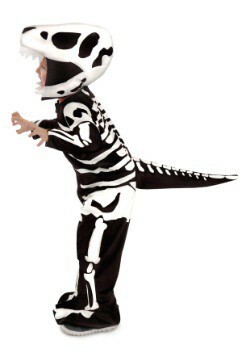 Check them all out and get your whole family doing a dino dance this Halloween. The easiest (and most fun) part of our job is curating the world's largest collection of Halloween costumes. 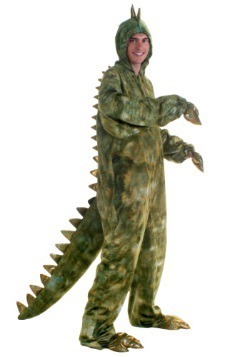 But what's the point of picking out the perfect look if you're not prepared for the ultimate costume experience? You can trust that we're not content to sell our styles without making sure that you're 100% ready for success with your costume! 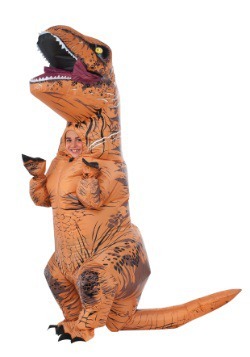 So that's why we go all-out and include our HalloweenCostumes.com How-To—because we want you to get the most out of your costume experience! 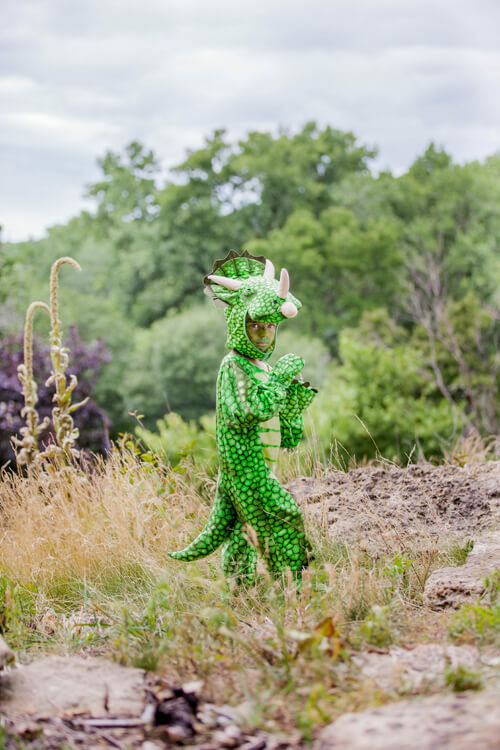 Dinosaurs are probably the most ferocious animals to have ever walked the Earth, so naturally we think they're the perfect way to have some costumed fun. 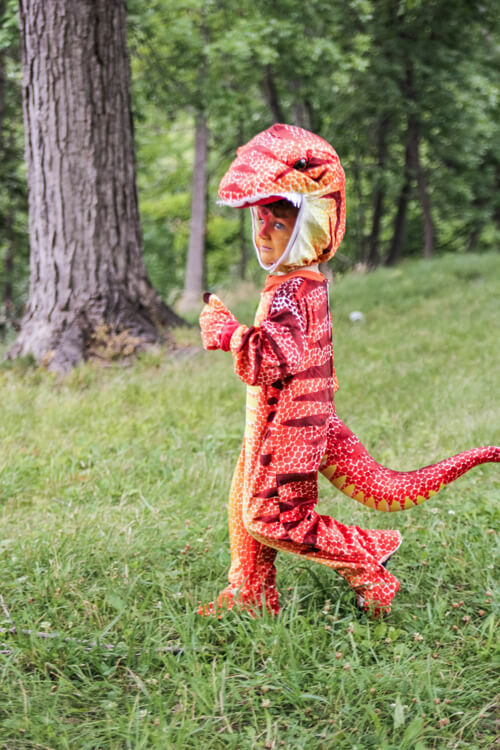 This guide will go over our favorite dino costumes for all ages, top notch accessories, and we've included the best tips on how to love your look to the fullest. Basically, it's the ultimate guide on how to be Jurassically cool, and how to show the world with all your social networks! 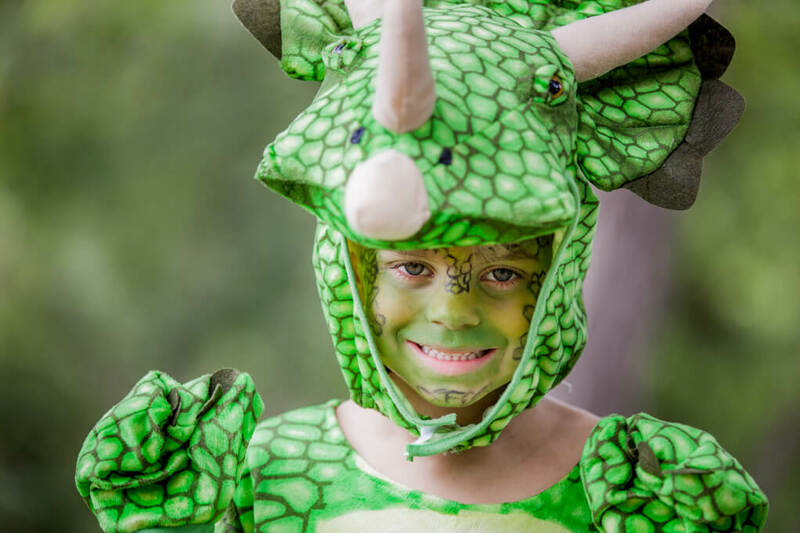 Whether shopping to become a rogue beast worthy of terrorizing the big party, or just assembling an epic play date or Halloween fun for a children's group, these ideas are sure to get you started. 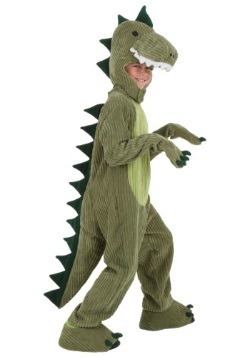 Peruse this section, and make your costume selections wisely. 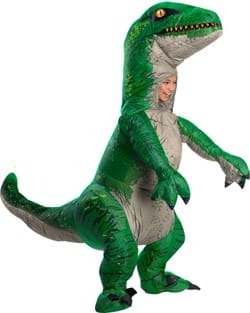 Because dinosaurs are going to roam the earth again when you go in one of these costumes, and they've left some big shoes to fill! 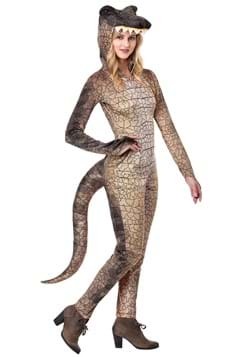 Here at HalloweenCostumes.com we are serious about all things costumes, so loving your look is a mantra that we don't just preach, we practice! 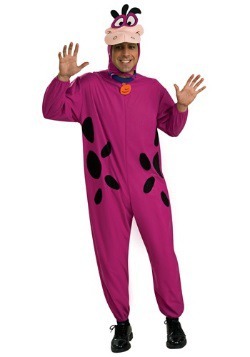 We're all about supplying one-of-a-kind looks to customers around the world, but if all we did was ship you the package, we'd be negligent in our solemn duty to enhance the costume experience in any way possible. 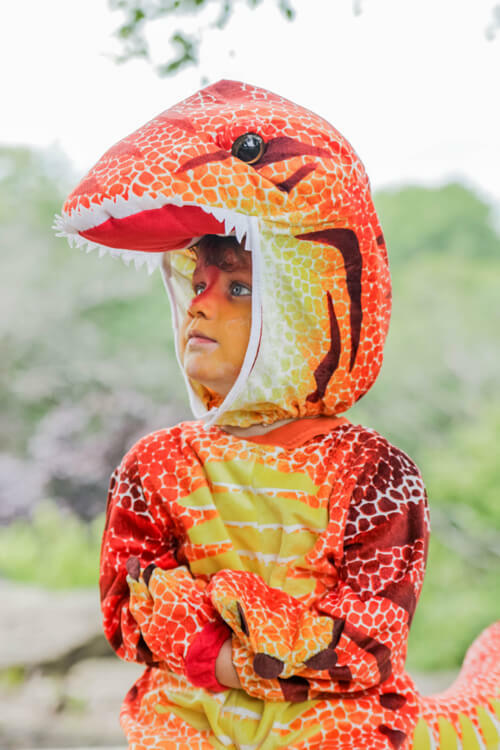 Whenever we can go the extra mile, we can and will, so we rounded up some of our favorite kids for an epic and fun afternoon in the park to celebrate one of our favorite things—dinosaurs. Check out these highlights from one of our all-time favorite playtime photo sessions. 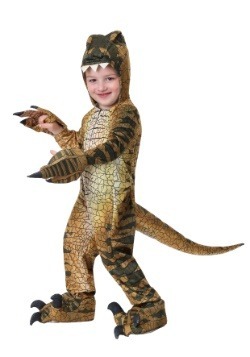 A few signature touches added to our delightful dinosaur costumes are sure to create instant memories, and when you enhance their looks with a little love and attention to detail, you'll be able to create moments that won't just be captured on film, but are sure to become cherished memories for all. 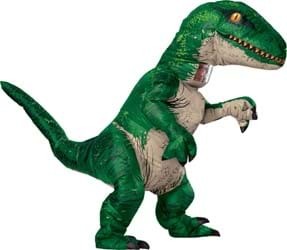 So he's all set up as a ferocious tyrannosaurus rex. 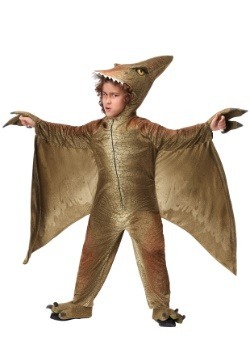 But is he ready to survey the Cretaceous scene as a terrifying predator? 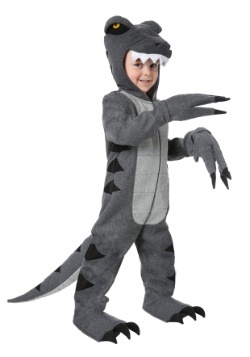 He's sure to have a hunger for some fresh prey, or at the very least some chocolate candy bars, so you're going to want to make sure he's ready to succeed in the wild (or on the trick-or-treat path). 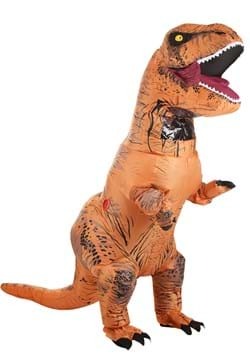 A light application of yellow and red make-up perfectly accents the rust and gold colors of this plush costume, and if we may say so, he'll look quite dashing when he uses his human eyes to hunt for prey beneath his plush T-Rex head. Whatever prey he has his sights set on, we're sure he'll be ready to devour them whole (preferably without the candy wrapper still on)! 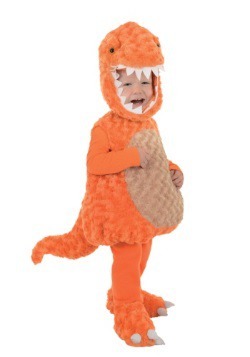 Once he's all set up in his toddler t-rex costume, we're sure he'll be ready to find a prime spot to watch his other dino friends revel and play while he sizes up the situation. 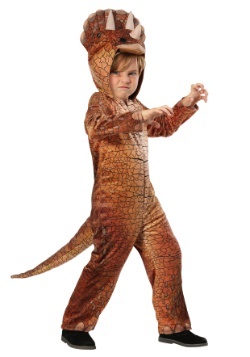 Whether in the park for a prehistoric recess, the playground for a dinosaur show-down, or even your living room for a Jurassic World viewing on the couch, he's sure to love his dino style with this costume. 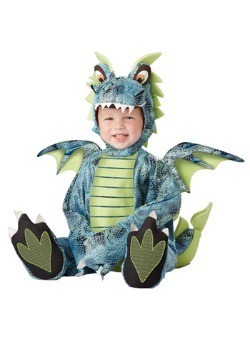 Soft plush costume headpiece will let him feel like an apex predator, whether he's proudly showing his felt fangs or even if he'd rather show off his human smile. Pose him on a perch for some great Instagram shots. He can be the stoic predator who's ready to pounce! 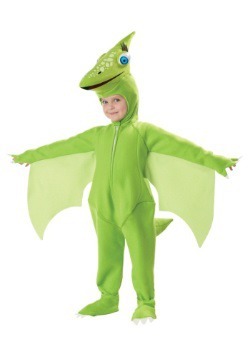 So, they're suited up in their favorite dinosaur costumes. 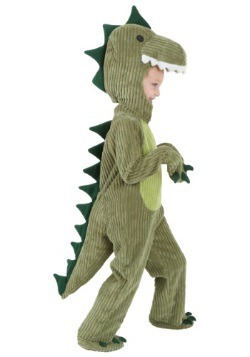 Plush fabrics and vibrant colors are sure to have your children standing out on the Jurassic scene, but are they ready to get into character? They're going to have to ramp up their personas to turn into the fierce jungle dwellers of lore, so you're going to want to have them practice their roars for their big costume event. 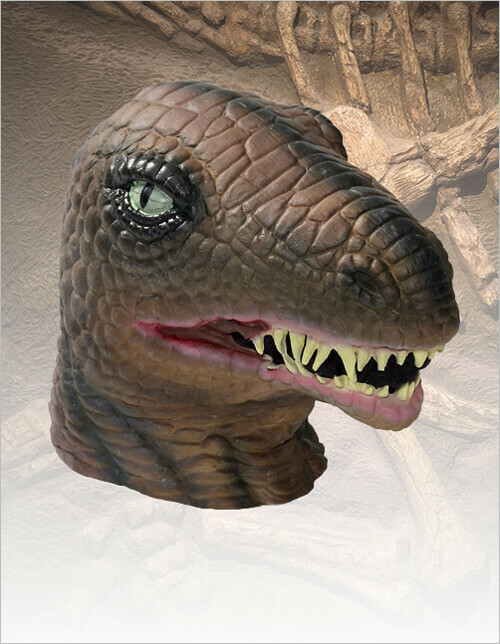 Whether enhancing their looks with makeup or just letting them enjoy the plush headpieces of a prehistoric mega brawler, when your little ones let out a bellow or a howl, we're sure that they're going to feel like they're going to be able to bring these ancient species out of extinction! 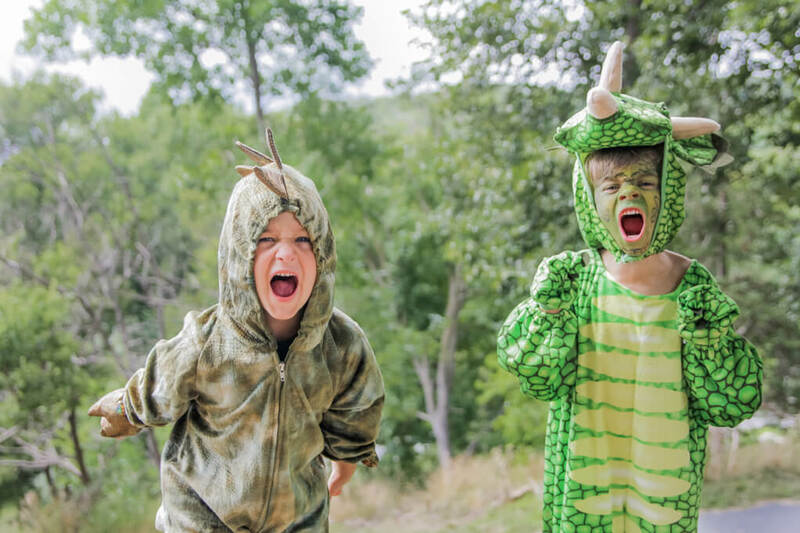 Play time in dino costumes might be on the playground or in the living room, but when they're ready to go on a Jurassic hunt, there's no place like the forest. 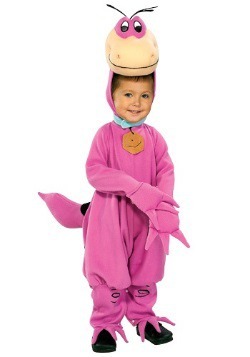 Even a pink T-Rex is sure to be ready to pounce when they overlook the Jurassic valley! They can practice their poses on a rock outcropping, and give their siblings a head start down the hill. 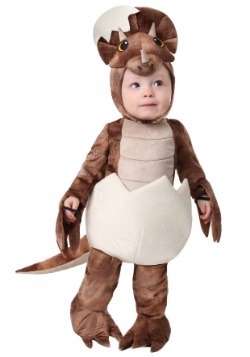 But when it's time to hunt, we're sure your little one will be ready to pounce and chase after with their plush horns and claws flailing. 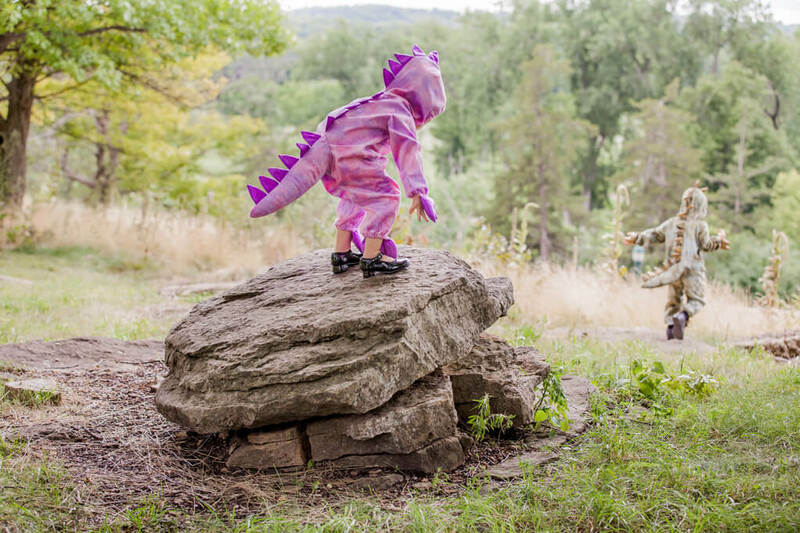 We're thinking the sight of a pink and purple spiked dinosaur careening down a park hill might just raise a few eyebrows... but totally in the best way possible! 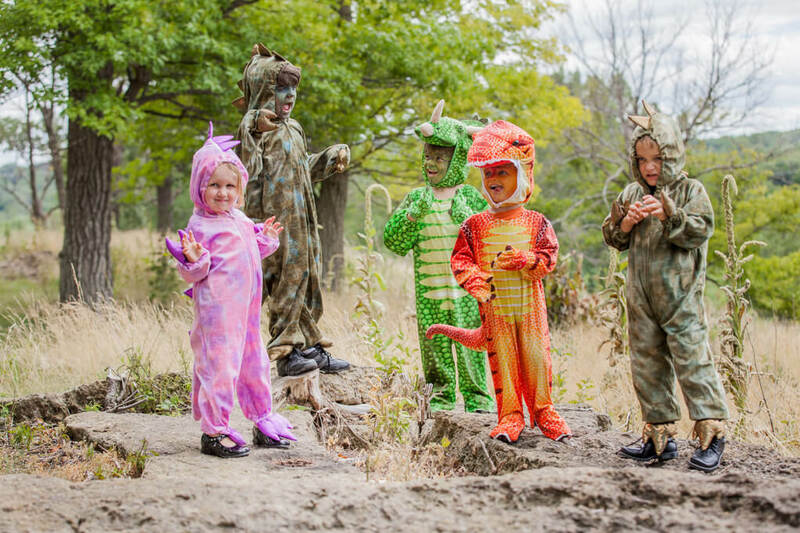 Playtime in your own wooded jungle just wouldn't be quite right without a prehistoric pack, so make sure your child's group has the chops to take some great snapshots before they head out to the party or start to make the trick-or-treating rounds. 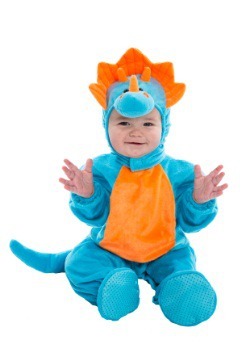 With siblings or best friends, each child is sure to have their own interpretation of dinosaur style, but you can let them play off each other to produce some pics poised for all kinds of Facebook likes! 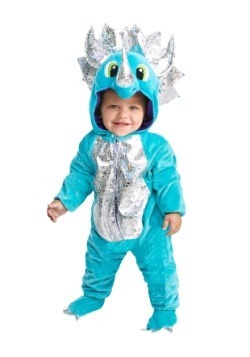 "Claws" up and facing outward can let any dinokiddo show off their fearsome stuff, and a ferocious growl can be a stow-shopper... but a coy smile doesn't really ruin the costume effect all that much anyways. 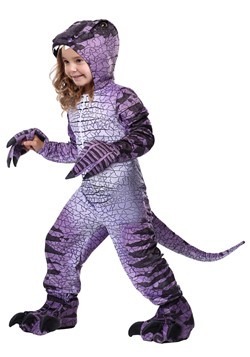 Get plenty of shots while they're playing, and when playtime is over, there's sure to be plenty of Jurassic memories stored for both them and you! Don't let all of that makeup detail go unnoticed in your photography! 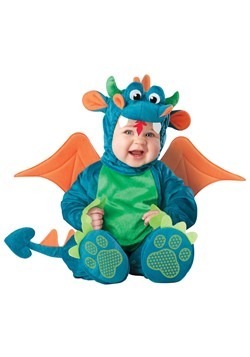 You might have provided a touch of face paint to complement their kids dinosaur costume, or even gone all-out with a YouTube inspired design, but either way, a soft shot of your little one will be the perfect way to capture those Halloween memories forever. Let him make a little face, or give off a fearsome smile. 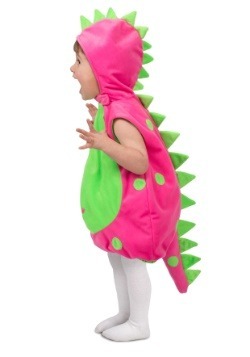 With a plush headpiece accenting their style, they can raise their dino claw hands and take a terrific shot that will have everyone nearby smiling. Force and power are the ways that the Tyrannosaurus Rex succeeds on the prehistoric battlefield, but for other species, it's all about tactics and stealth. 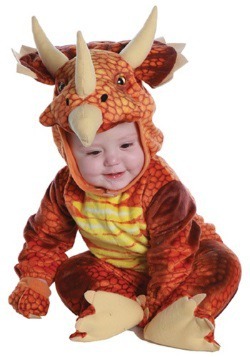 When your little one has this ferocious Triceratops costume, we're sure you'll be able to grab a candid shot while they're sneaking up on their friends. 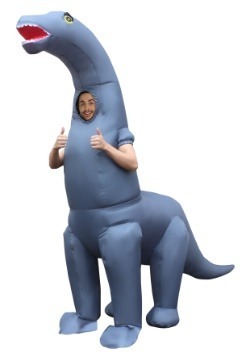 Let them slip out of the woodline of the forested "jungle" and they'll be able to slip in the tall grass where the other dinos won't be able to see their horns. They might be wearing a serious look on their face, because when you're on the hunt as a dinosaur, it's business that's best taken seriously! Take your favorite picture before he or she rejoins the group for play time. 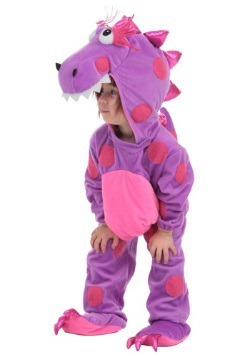 Downtime during a dino play session doesn't mean that you should stop the photo reel or video recording. Sometimes an innocent moment can be captured and create a cherished memory. 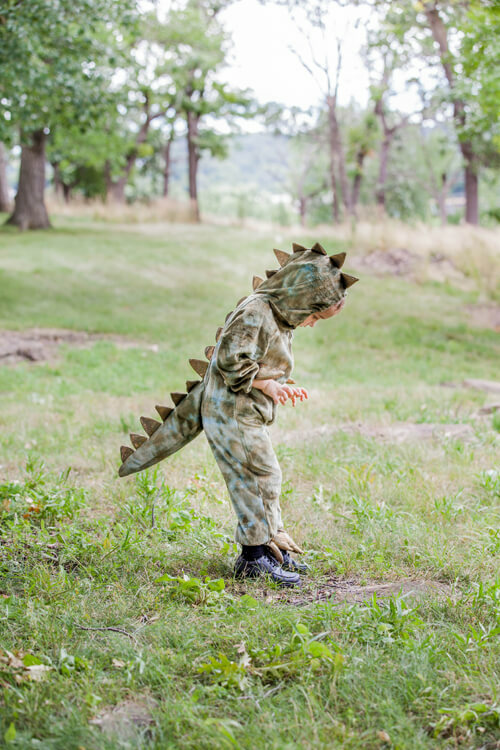 In this photo, we're not sure if little Ethan is sizing up a prehistoric bug for a quick Jurassic snack or even if he's just checking to see if his laces are still tied. 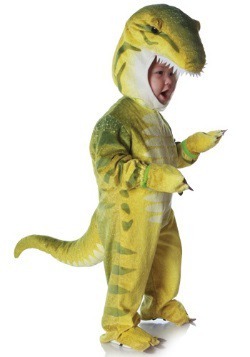 (Yes, it's okay if your little dinosaurs have shoes!) 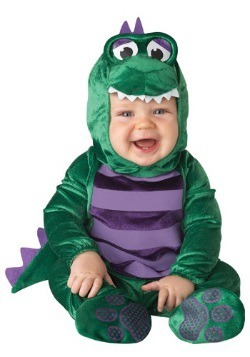 Capture your children in some innocent moment to create treasured costume memories. 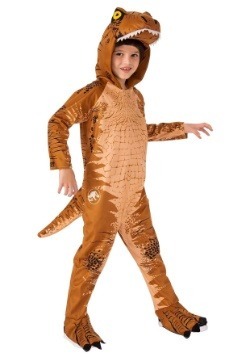 It's a well-established fact that kids of all ages love dinosaurs, so naturally one of the perennial go-to favorites for a costume is a tried and true jumpsuit look. 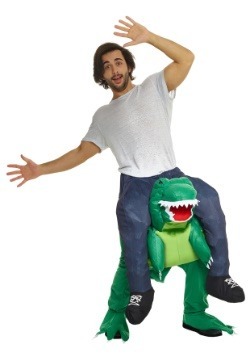 But that's not to say that adults can't get in on the Jurassic action either! 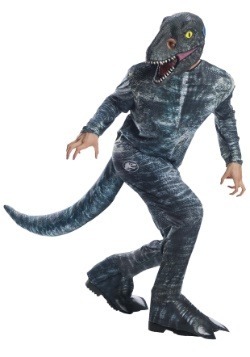 Whether you’re all grown up and still harboring an interest in paleontology, looking to complete a family Dino group theme, or just young-at-heart and still perpetually obsessed with the Jurassic Park movies, we have dinosaur costumes for men and women, and children of all ages. 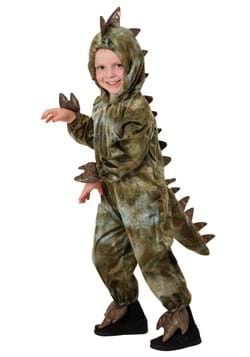 Here are some of our favorite roar-tastic dino costumes that we've curated as top sellers and fan favorites. 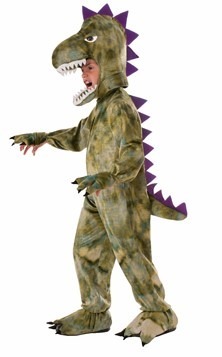 Whether you're just suiting up your children or you’re looking to go Cretaceous crazy yourself, these Dino costumes will have you feeling like ancient mega fauna! 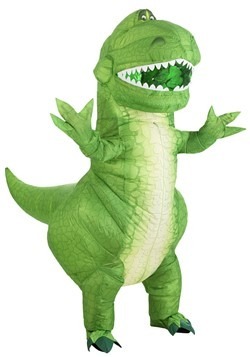 Just because you're all grown up doesn't mean that your Dinosaur costume necessarily has to be fierce on T-Rex Tuesdays! 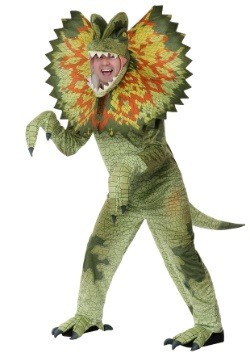 This adult costume will let any man or woman become a plush prehistoric predator. 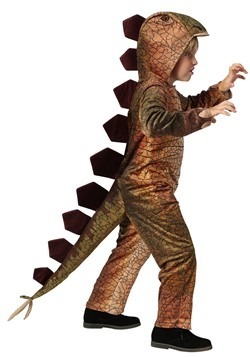 This corduroy style jumpsuit costume features a soft sculpted headpiece and fleece scales, so we don't think your children or significant other will mind one bit snuggling up with you. 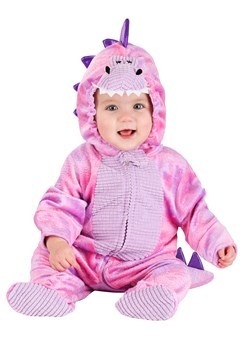 Coordinate your look with your child’s costume to be the ultimate dino-chaperone, or with your partner for some soft and snuggly dinosaur fun for grown-ups. 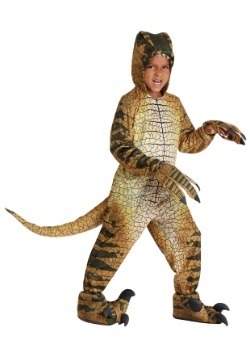 With these plush looks, you don't even need to practice your roar! Triceratops have to be one of the most popular four legged dinosaurs, and with their signature triple spiked face, we can't really blame their admirers all that much! 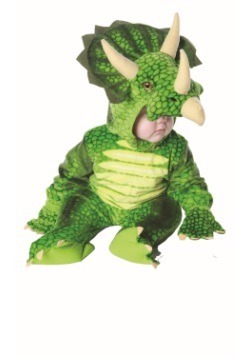 Of course, these plant eaters were more about using their horns for defense, but when your little one is suited up in a delightful triceratops costume, they'll have plush soft sculpted horns that will mean that they're still going to be eminently huggable! 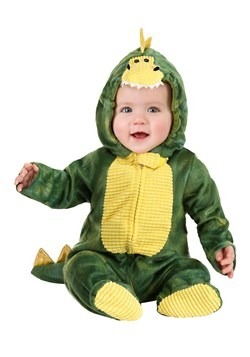 Suit your infant or toddler up in this cozy baby dinosaur costume, and they'll still be able to show off their smile, even though their head will have the fierce face of a dinosaur topping it off. We're sure when your tot lets their toothy grin shine, all will know that your little extinct one is going to grow up to be a party animal! Just because we only get to experience dinosaurs today as fossils, doesn't mean that those old bones can't see a new life! 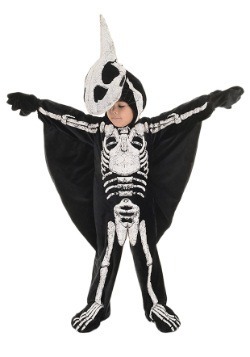 These charming costumes imagine just what would happen if those museum bones took on a whole new life! 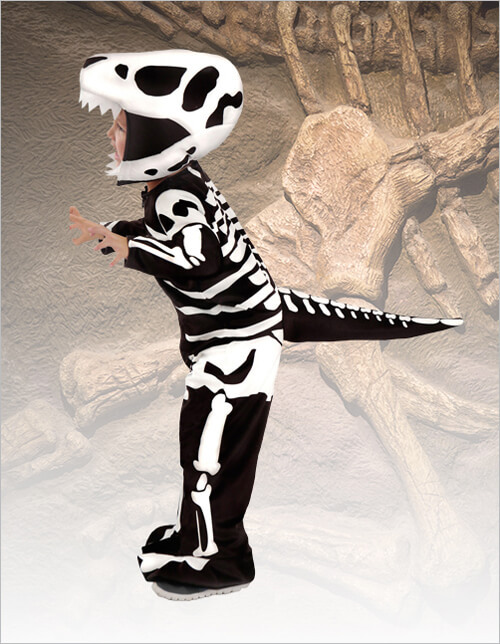 Suit your child up as a T-Rex skeleton dinosaur or even as set of Pterodactyl or Triceratops fossil creatures that are ready to rule the earth again! 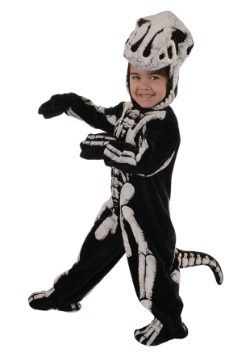 The perfect Halloween theme, these soft sculpted dino fossil costumes will have any little boy or girl ready to dust off some dirt and start roaming the planet! 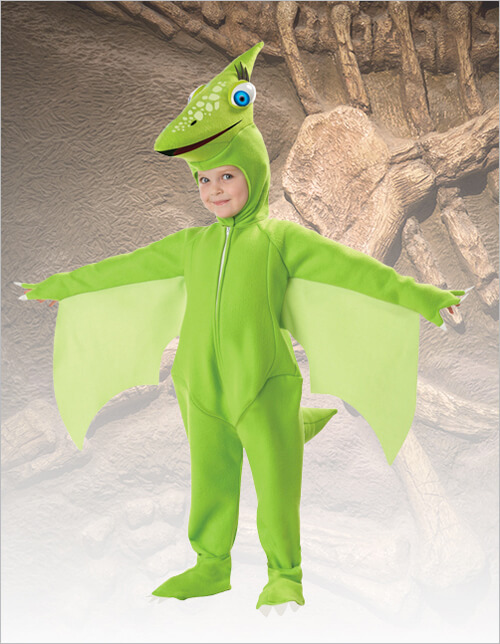 Of course, TV shows with dinosaurs are always hot properties, and if you have a little boy or girl who is into Dinosaur Train, we're sure that they'll love suiting up as Tiny Pteranodon! 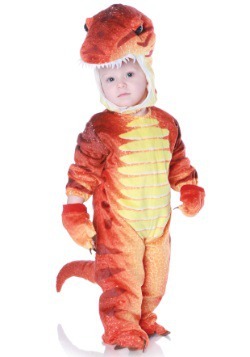 Learning will be fun with your child as Tiny, and when that train starts roaring down the tracks straight from PBS, your little one will be ready to learn and to have some costume playtime fun. Coordinate their look with their BFF or sibling as Buddy, and you'll have a team of preschool aged characters ready to engage themselves in natural science and history! 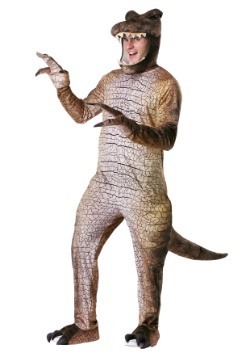 So, you have your costume picked, and you're ready to hit the Halloween scene as a Cretaceous creature. But have you done everything you can to make sure your dino game is in tip top form? 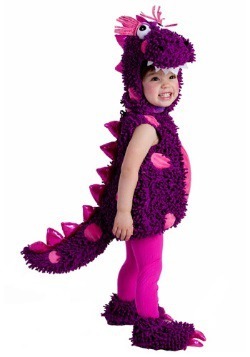 Our dinosaur accessories can amp up the fear factor with fearsome teeth, or transform a plush costume into the ultimate cute and cuddly dino look. 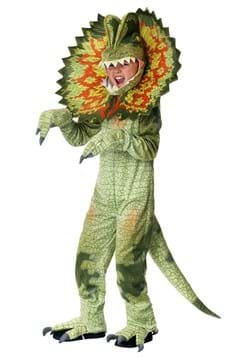 And, of course, we have pet costumes that will transform your pooch into a prehistoric predator! Check out these best-of accessories to complete your costume ensemble. When you break into the control room to feast on some tasty humans, we're not sure you're going to make the best impression with face paint and some fake teeth. 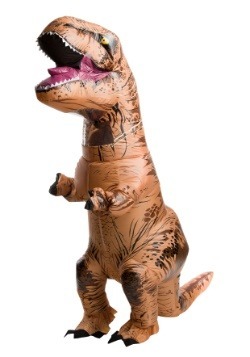 So when you're looking to take your velociraptor game to the next level, you're definitely going to want a latex mask. Molded teeth and latex scales are sure to strike fear in your victims, or at the very least, get you to the front of the line at the bar! 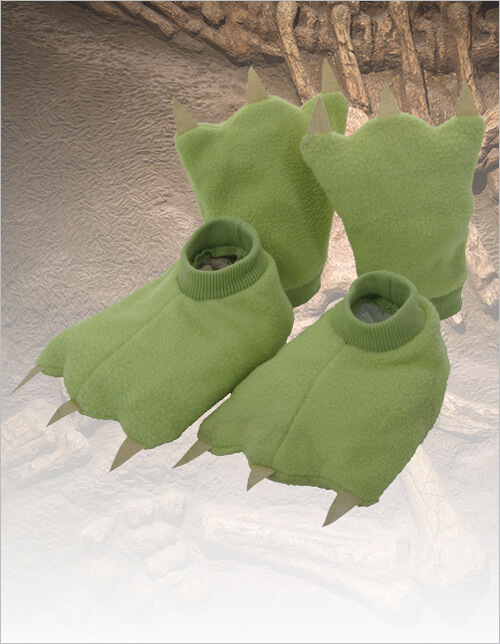 Give your child's look a cozy upgrade when you complete their costume look with these plush fleece slipper and mittens set. 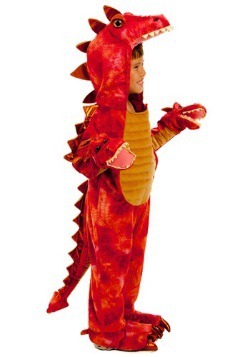 They'll love having a touch of authenticity, even if the claws are all felt! (And we're sure you'll love not getting your face scratched when you go in for the hug). 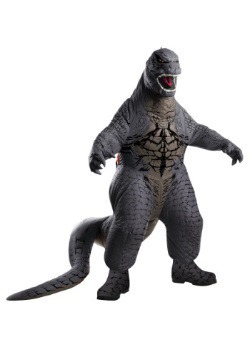 Complete their detailed dino costume with this exclusive set for the perfect touch. 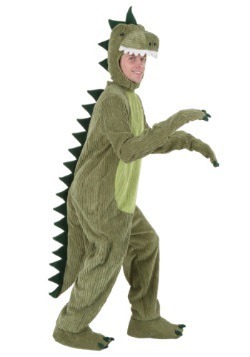 Sometimes, going in a head-to-toe dino costume just isn't appropriate for every situation. 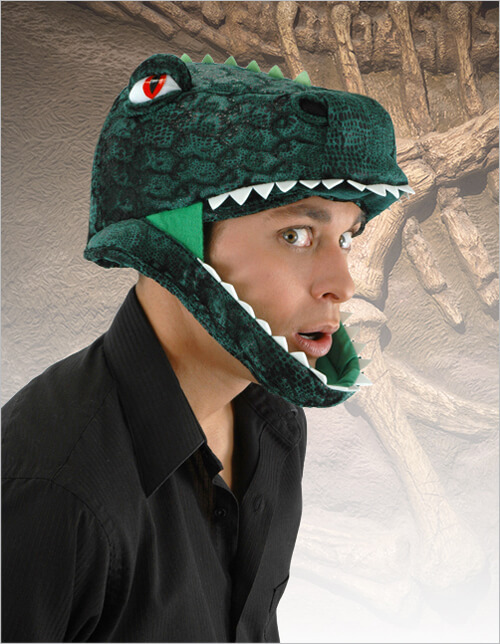 In that scenario, let us suggest just giving your head a Jurassic treatment by topping your dome with this padded t-rex hat! 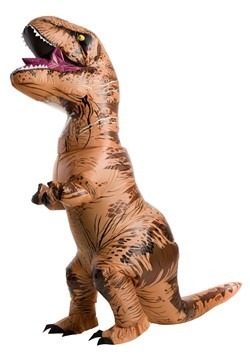 You can rock this fun style with your favorite party outfit, and everyone's going to know that you're a Tyrannosaurus who is ready to party hard. Our fun plush hats work with jumpsuits or with a t-shirt and jeans for when you feel like putting in a minimal effort! 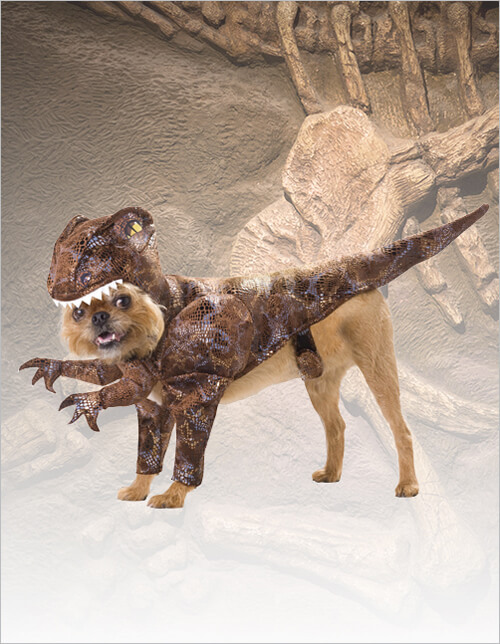 Do not — we repeat — do not let your pets miss out on all of the dinosaur action! 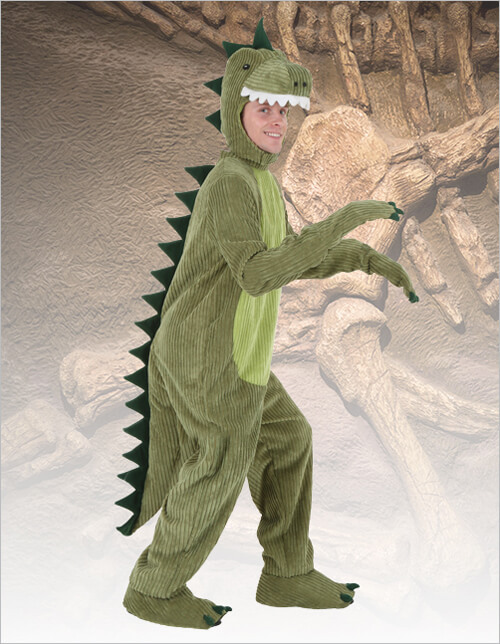 We have costume looks that will let any four legged friend get in on the Cretaceous showdown. 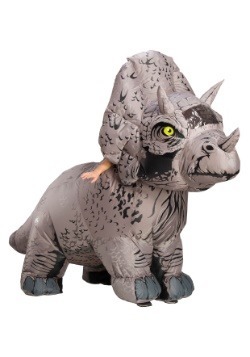 Whether you've got a few pooches that you're ready to transform into a fearsome velociraptor pack, or you just want to turn your beloved pug into a triceratops, these fun costumes are the perfect way to complete your family's group theme. 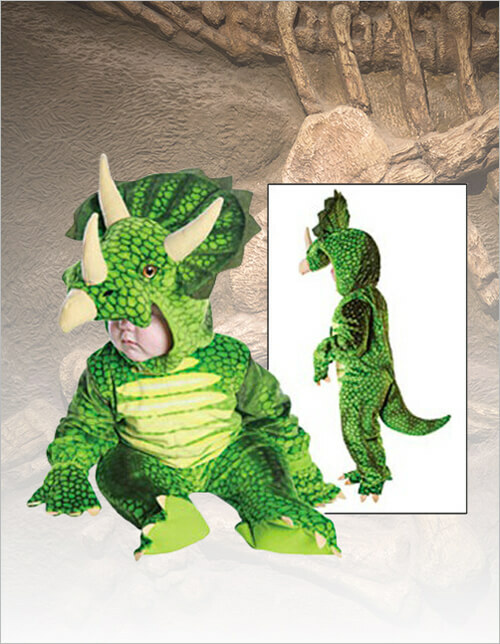 These costumes are specially designed to be easy to wear for pets, which is important because when you've got a pint sized dinosaur ready to rumble in your home, you might just be in for a prehistoric tussle over that steak bone!